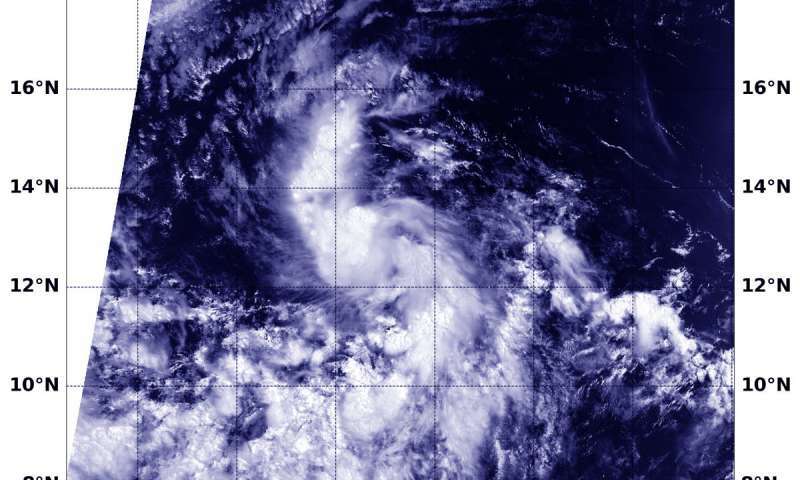 The Eastern Pacific Ocean's Tropical Depression 8E formed on July 26 and strengthened into a tropical storm by 5 a.m. EDT on July 27. At that time the storm was renamed Gilma. NASA's Terra satellite provided forecasters with an early look at the eighth depression as it was developing. On July 26 at 2:25 p.m. EDT (1825 UTC) when Tropical Depression 8E was strengthening, NASA's Terra satellite passed overhead and the MODIS instrument or Moderate Resolution Imaging Spectroradiometer captured a visible light image. The image showed strongest storms around the center and in fragmented bands extending to the north and south. On July 27, the National Hurricane Center noted that the northwesterly wind shear disrupted the already poorly organized cloud pattern associated with Gilma. The center is now exposed and located on the northwestern edge of the convection. By 11 a.m. EDT (1500 UTC) the center of Tropical Storm Gilma was located near latitude 14.9 degrees North and longitude 128.4 degrees West. Gilma is 1,325 miles (2,135 km) west-southwest of the southern tip of Baja California, Mexico. The National Hurricane Center said that Gilma is moving toward the west-northwest near 17 mph (28 km/h), and this motion is forecast to continue for the next 2 to 3 days. The estimated minimum central pressure is 1006 millibars. Maximum sustained winds are near 40 mph (65 kph) with higher gusts. NHC noted "Wind shear and cooler waters will induce weakening, and Gilma is expected to become a remnant low in 3 days or earlier. Dissipation is expected thereafter."